Above: A 1950 publicity portrait of Duncan Renaldo as the Cisco Kid, a character he played in both film and television. Duncan Renaldo, who became one of television’s first Western stars in the later years of his career, served a long apprenticeship as a sidekick in many 1930s and 1940s B-westerns and serials. Suave and debonair, with a Latin facility of gesture and expression, Renaldo could lend energy to the most basic dialogue, and was more than athletic enough to be convincing in action scenes. Only his indeterminate but distinctive foreign accent prevented him from becoming a full-fledged serial and B-western star in his own right, since he was quite as charismatic as the stars he supported. Duncan Renaldo’s early life is somewhat shrouded in mystery. He was apparently born Basil Couyanos in Oancea, Romania–although he might have been an orphan adopted by the Couyanos family. It seems that he grew up in Europe and began to travel the world as a ship stoker while still quite young. In 1921 or 1922, he was working aboard a Brazilian ship that burned in a Baltimore harbor, stranding him in the US. He remained in the States after the expiration of his 90-day seaman’s permit, working as a portrait painter before breaking into the movies in 1928. His first film assignment was a role in a lost silent film called The Devil’s Skipper, produced by the independent studio Tiffany-Stahl. After appearing in a few more Tiffany-Stahl productions, he was signed to a contract by T-S’s distributor Metro-Goldwyn-Mayer in 1929. The following year, MGM began production of their famed early talkie Trader Horn, and cast Renaldo as the film’s co-star and romantic lead. Horn’s on-location filming in Africa was a long and nightmarish process for all concerned, but it caused especial trouble for Renaldo. When he returned to the US, unfounded rumors of an affair between him and Trader Horn’s female lead Edwina Booth shadowed the film’s 1931 release, and probably contributed to MGM’s decision to drop his contract. He freelanced for a few years in several low-budget independent films, playing leads and supporting parts, before being hit with more Horn-related woes in 1934. In obtaining a passport for his journey to Africa, Renaldo had misrepresented himself as an American citizen, and when this falsification became known he found himself facing federal charges. He spent about a year in prison before receiving a presidential pardon in 1936, after which he applied for US citizenship and resumed his movie career, taking multiple supporting roles in low-budgeted independent films like Rebellion and Lady Luck. 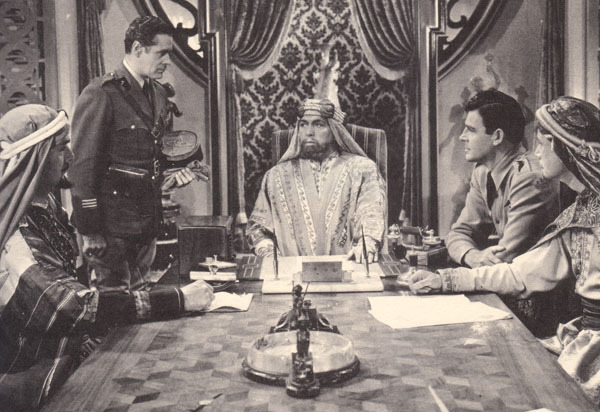 Above: Duncan Renaldo and Maston Williams plot with a pair of Indian leaders in The Painted Stallion (Republic, 1937). Renaldo’s Republic contract didn’t bar him from working at other studios; shortly after completing Painted Stallion, he played another uncharacteristically villainous character in Columbia Pictures’ first serial, Jungle Menace (1937). A talky, poorly-plotted, but occasionally interesting serial, Menace starred the well-known Frank “Bring ’em Back Alive” Buck as himself and pitted him against a gang of jungle rubber pirates. Renaldo was cast as Armand Roget, the suave owner of a tropical night club called the Southern Cross; he was also the secret middleman between seemingly-respectable businessman Richard Tucker and the pirate gang. Renaldo’s character was occasionally allowed to be slick or sinister in interactions with the good guys or with his underlings, but spent more time being alternately browbeaten by Tucker and by murderously rebellious henchman LeRoy Mason (who gunned down Renaldo in the final episode). Renaldo did do a good job of registering nervousness and cowardly suavity in these sequences, but his role was definitely one of the serial’s less rewarding ones. Above: Duncan Renaldo and LeRoy Mason confront each other in Jungle Menace (Columbia, 1937). Renaldo finished out 1937 with a third serial, Republic’s excellent Zorro Rides Again. The cliffhanger featured John Carroll as James Vega–the great-grandson of the original Zorro–who reassumed the family mask to combat modern-day outlaws preying on the California-Yucatan railroad. The thirty-something Renaldo, with his hair grayed, did a very convincing job as the Vegas’ old family servant (named Renaldo! ), the only one aware of James’ double identity. Renaldo’s elderly but enthusiastic character was slightly more comedic than the later sidekicks he played, but Renaldo gave him a dignity that overshadowed his occasional pratfalls. Above, from left to right (foreground only): Duncan Renaldo, Reed Howes, and Helen Christian in Zorro Rides Again (Republic, 1937). 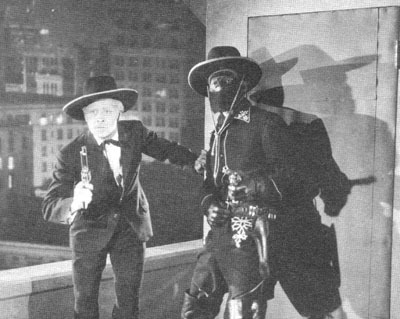 Above: Duncan Renaldo and the masked John Carroll in Zorro Rides Again. For some reason, Renaldo spent most of 1938 away from Republic, playing some small character roles in Paramount films like ZaZa and Spawn of the North, and a major role in Monogram’s Rose of the Rio Grande. However, early 1939 saw the release of The Lone Ranger Rides Again, the Republic serial that established Renaldo’s enduring screen image. Instead of being a villain or an elderly retainer, Renaldo played a vigorous and quick-thinking assistant hero–a New Mexico settler named Juan Vasquez. In the opening chapter, Vasquez’s brother was murdered by a fake Lone Ranger in the pay of land-grabbers, sending Juan off on a manhunt for the killer. The real Lone Ranger (Robert Livingston) helped Vasquez bring the phony one to justice, then enlisted Juan to help him discover the man behind the land war. 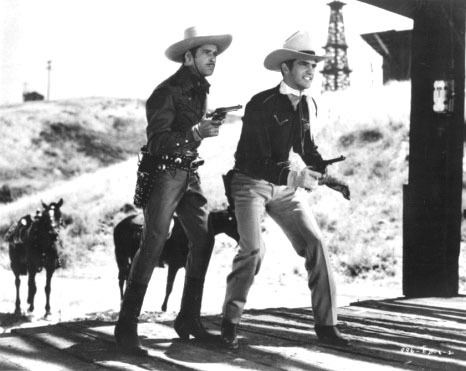 Though it fell short of Republic’s first Lone Ranger serial, Rides Again was entertaining, and was helped along by the engaging performances of Livingston and Renaldo, who played well off each other. Above: Robert Livingston aids a wounded Duncan Renaldo in The Lone Ranger Rides Again (Republic, 1939). 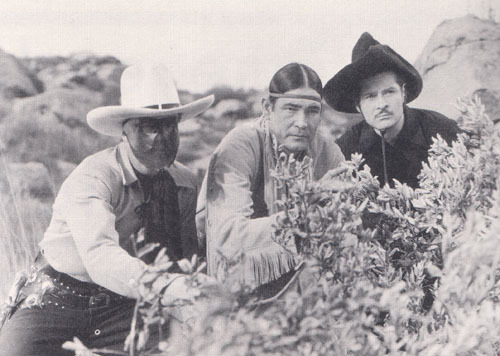 Above, from left to right: Robert Livingston, Chief Thundercloud, and Duncan Renaldo in The Lone Ranger Rides Again. 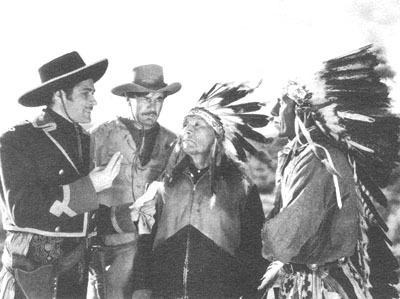 Republic planned to feature Livingston and Renaldo–along with Chief Thundercloud as Tonto–in a follow-up series of Lone Ranger B-westerns, but their rights to the Ranger were revoked by copyright holder George Trendle. Instead, Livingston and Renaldo joined Raymond Hatton to star in a new incarnation of Republic’s popular Three Mesquiteers B-western series. This version of the series lasted from 1939-1940, numbering seven films in all, and allowed Renaldo (in the role of Mexican cowboy hero Rico) to further develop his image as a carefree but dependable South-of-the-Border adventurer. In 1941, Republic cast him in another serial, King of the Texas Rangers. 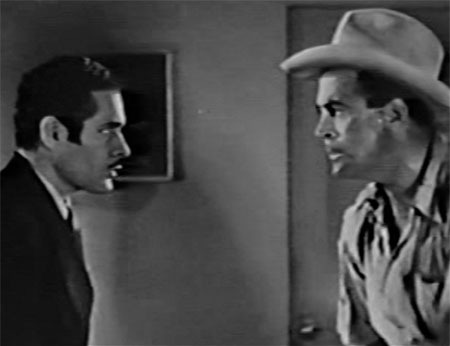 One of the studio’s very best chapterplays, King chronicled the fight of a modern-day Texas Ranger (famed football star Sammy Baugh) against a gang of Axis spies and saboteurs; Renaldo played Lieutenant Pedro Garcia, an officer of the Mexican Rurales, who assisted King throughout. 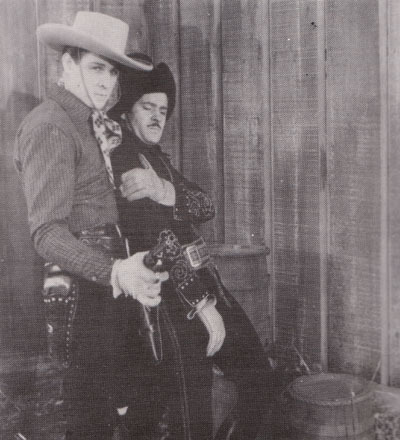 The helpful Renaldo gave the new-to-movies Baugh the benefit of his considerable experience, and helped him carry off many dialogue scenes; Baugh himself later recollected that “…[William] Witney and [John] English directed Texas Rangers but Duncan Renaldo directed Sammy Baugh.” Baugh and Renaldo’s genuine friendship was reflected on screen, which enhanced the already first-rate serial. 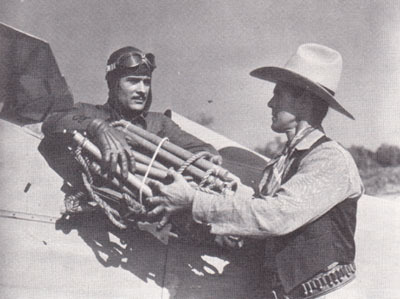 Above: Kermit Maynard hands Duncan Renaldo a rope ladder required for a dangerous aerial rescue in King of the Texas Rangers (Republic, 1941). 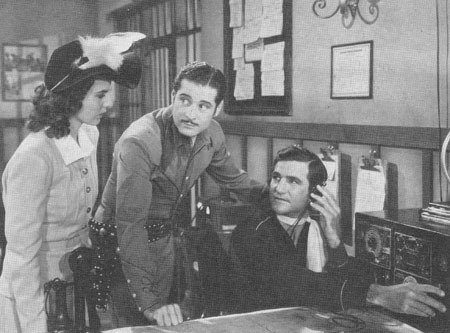 Above, from left to right: Pauline Moore, Duncan Renaldo, and Sammy Baugh in King of the Texas Rangers. After some supporting roles in Republic (Down Mexico Way, Gauchos of El Dorado) and non-Republic B-westerns (the Hopalong Cassidy entry Outlaws of the Desert), Renaldo made another serial appearance in Republic’s King of the Mounties (1942). His role in this fast-moving wartime adventure was small; he played a villainous French-Canadian trading post clerk who worked for quisling Douglas Dumbrille, and did nothing but occasionally relay messages to Dumbrille until the eleventh chapter, when he was exposed as a traitor and got into a fight with Mountie hero Allan Lane; he was arrested and forced into helping to trap Dumbrille in the succeeding chapter, and was then gunned down by Lane after another fight. Following another turn in a Hoppy film (Border Patrol) and a minor role in the big-budget picture For Whom the Bell Tolls, Renaldo took another major serial part in Secret Service in Darkest Africa (Republic, 1943). This time, he was a Free French Captain (Pierre LaSalle) in Allied North Africa, aiding hero Rod Cameron in his fight against a band of Nazi agents. Secret Service was probably Republic’s most action-packed and frenetically-paced cliffhanger, and–perhaps as a result–Renaldo’s performance was most subdued and least energetic of his serial turns. He might have felt that there was little point in establishing a strong characterization, since his stunt double would be playing LaSalle in more than half of the serial. Above: Duncan Renaldo (standing) reports to the Sultan’s council in Secret Service in Darkest Africa (Republic, 1943). Lionel Royce is at the head of the table, Rod Cameron is seated opposite Renaldo, and John Davidson is next to Cameron. Renaldo made his last serial, Republic’s The Tiger Woman, in 1944. Set in South American, this cliffhanger introduced “serial queen” Linda Stirling to Republic’s audiences as an heiress raised in the jungle by a native tribe. She was targeted by villains who coveted her inheritance and her tribe’s oil lands, and defended by hero Allan Lane, agent of a non-villainous oil company. Renaldo was Jose Delgado, the South American representative of Lane’s company and Lane’s regular ally in his fight against his unscrupulous rivals. Renaldo played his part very seriously here, with little of his usual cheerfulness, but showed much more energy than he had displayed in Secret Service in Darkest Africa; his character came off as a worry-prone but dependable and likable “company man.” Off-screen, he found time to play acting and riding instructor for the newcomer Linda Stirling, helping her as he had Sammy Baugh. 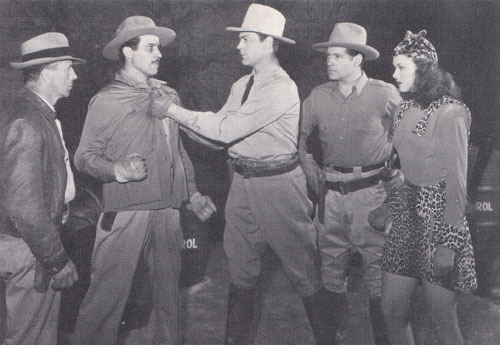 Above, from left to right: Duke Green, George J. Lewis, Allan Lane, Duncan Renaldo, and Linda Stirling in The Tiger Woman (Republic, 1944). 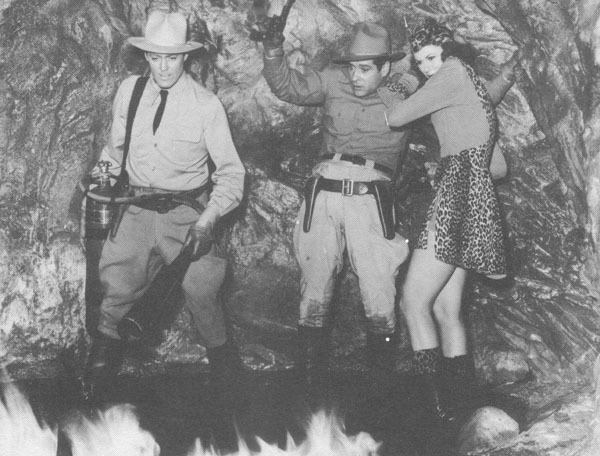 Above: Allan Lane comes to the rescue of Duncan Renaldo and Linda Stirling in The Tiger Woman. 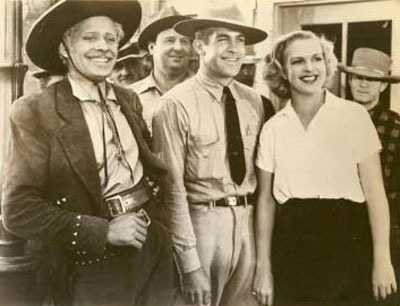 Renaldo reunited with Lane and Stirling to play another second lead in his final Republic production, the 1944 B-western Sheriff of Sundown. His Republic contract now expired, Renaldo moved to Monogram to star in three Cisco Kid B-westerns in 1945. He had finally found a starring role that jibed with his accent, but the clean-cut persona he had created in his serials and Three Mesquiteers films didn’t quite square with the roguish Cisco Kid image established by earlier actors like Warner Baxter. Gilbert Roland replaced him as Monogram’s Cisco in 1946, and Renaldo almost dropped out of acting work for a few years, making only a few movie appearances but writing and co-producting several low-budget films like Screen Guild’s Bells of San Fernando and PRC’s Don Ricardo Returns. In 1948, he became a producer with an outfit called Inter-American, which acquired the rights to the Cisco Kid character. Renaldo returned to the role of the Cisco Kid as both producer and star, and retooled the happy-go-lucky outlaw into a genial but incorruptible wandering caballero. After starring in five Cisco features (beginning with 1948’s Valiant Hombre and ending with 1950’s Girl From San Lorenzo), Renaldo bade farewell to feature films for good when the TV studio ZIV Productions launched a Cisco Kid show–the first American color TV series–in 1950. 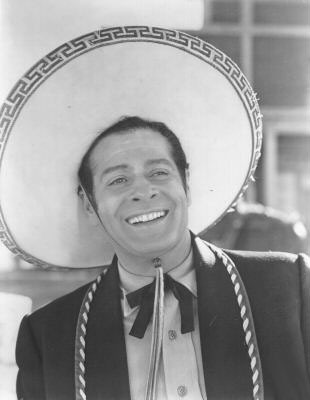 Renaldo, paired with Leo Carillo as comic sidekick Pancho, starred in the Cisco series for six seasons, winning a loyal following among young TV viewers. In 1956, he retired from acting and moved to Santa Barbara in 1956, but remained in touch with his many fans and continued to make personal appearances as Cisco–touring with circuses, hosting local pioneer celebrations, and the like. He passed away in a hospital in Goleta, California, in 1980. Duncan Renaldo’s initial serial work, coming at a low point in during his Hollywood tenure, set him back on an upward path that eventually led to his television success and even a star on the Hollywood Walk of Fame. Renaldo more than repaid his debt to the genre that resuscitated his career by giving multiple chapterplays the full benefit of his gentlemanly but effervescent presence. Few actors could make routine sidekick lines like “We must try and beat them to the refinery” or “Ah, now I see why they tried to prevent us from reaching the ranch” sound as lively or intelligent as Duncan Renaldo did. Above: Duncan Renaldo and Sammy Baugh in King of the Texas Rangers (Republic, 1941). Acknowledgments: Some of my sources for this article include a transcript of the judge’s ruling on Renaldo’s appeal from his federal conviction, the Old Corral’s excellent page on Renaldo and some of its appurtenant links, two Google-derived newspaper articles (one an article referring to Renaldo’s citizenship application, the other his obituary), and issue 26 of the serial magazine Those Enduring Matinee Idols–which featured a 1974 interview with Sammy Baugh that’s also available online at the Old Corral. Oh Cisco, Oh Pancho…………..See you next week Amigos!